Last Saturday, Movie Buddy Numero Uno Melissa and I decided to take advantage of the cheap movie prices at the Village 8 off of Dutchman’s Lane in Louisville. As usual, the movies took advantage of us. We saw 1408 and Evan Almighty for $3 each. But later in the evening I had much better luck Han Solo with the post-matinee Rescue Dawn, which still only cost me $4. 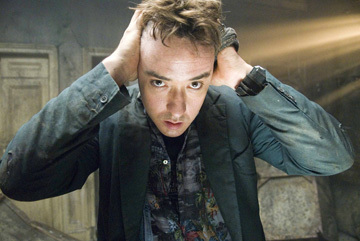 I’d been wanting to see 1408 since it opened in June. It’s based on the story of the same name from Stephen King’s most recent short fiction collection, Everything’s Eventual, which I liked, even though the endings tended to wrap up more neatly than the meaner, scarier and often more ambiguous resolutions of his previous volumes. It had been quite a while since Melissa and I had regrettably seen Marie Antoinette at the Village 8, and we both got lost on the way there. She called me to ask where she might have made a wrong turn, but ended up finding it before I did after I subsequently got lost and had to rely on her directions to get there. But we both finally made it just in time for the movie, and took our seats in an area of the theater that smelled strongly of urine. (Again, these are the sacrifices you make for cheap movies.) So we moved to another set of seats that smelled slightly less like urine. And so began 1408, which was one of my favorite stories from Everything’s Eventual because it’s about a) a writer and b) the paranormal. The original story was pretty lean, so lots of stuff was added to the pad the film out to a movie-sized running time. We begin with Mike Enslin (John Cusack), an author who writes books about real-life haunted hotels and cemeteries and the “ghoulies and ghosties and long-legged beasties” that inhabit them. But he doesn’t really believe in the stuff, and he’s never actually encountered anything paranormal. So one day he gets a postcard from the Dolphin Hotel in New York City, upon the back of which is scribbled, “Don’t enter 1408.” He quickly does the math and discovers that the message has 13 characters, and that the numerals in “1408” also add up to 13. Intrigued, he decides to leave his sweet little pad in Hermosa Beach and travel to the Big Apple to find out what this “room 1408” business is all about. As it turns out, it takes his agent (Tony Shaloub) and all of his publisher’s legal eagles to even get him in the room. And when he arrives to check in, the staff of the Dolphin does everything it can to try to convince him to stay in any other room than 1408. So Enslin ends up having a spectacularly written and cracker-jackily acted meeting with the Dolphin’s manager, Gerald Olin, who’s played by Mr. Samuel L. Jackson. Olin tells Enslin that nobody lasts more than an hour in 1408 and that, over the years, 56 people have died in there. The ones who didn’t go nuts and kill themselves died of natural causes that are only natural to people who literally get scared to death. And Olin’s got a giant file folder filled with stories and police reports and disgusting photographs of the victims to prove it. Olin’s also frank about the ultimate reason why he doesn’t want Enslin to enter 1408 — he doesn’t want to have to clean up the inevitable bloody mess. Cusack and Jackson are wonderfully dynamite and dynamic in this scene; it’s probably my favorite in the entire film. (I love the bit where Olin asks Enslin if he’d like some cognac, and Enslin replies, almost offended, “Did I not just tell you I’m a writer?”) What’s especially palpable is how sincere and truly concerned Olin is for Enslin’s safety. When he offers to let Enslin take pictures of 1407, because it looks just the same and no one will ever know the difference, he means it. But Enslin insists on 1408, and Olin reluctantly hands over the heavy old metal key — a nice, scary touch, by the way — to the infamous room. It should also be noted at this time that director Mikael Håfström — whose name took me 11 minutes to type — succeeds quite effectively in making the old-timey hotel, the room itself and even the door key feel like characters that are just as real as Enslin is. And the second Enslin enters the room, prepare to be terrified by the ominous fear that oozes from each of its seemingly normal corners (even though Enslin hilariously declares, “This is it?” in what turns out to be the last time you’ll laugh during this movie). 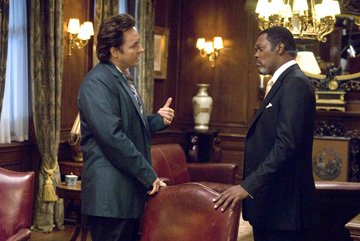 There’s something quietly alive and waiting about 1408, and Enslin’s about to find out the hard way what it is. The first round of terrors and scares is so finely crafted and subtly presented that you’ll be lucky to pry your fingers from your kneecaps when it’s over; Melissa spent much of the movie with her eyes closed and her hands covering her ears. But we both agreed that, after that, the film takes so many bizarre and surrealistic turns that it loses the momentum it had previously built up with a great deal of care and dread. And as the film goes on, it gets deeper into the new-for-the-movie subplot of the daughter (Jasmine Jessica Anthony) that Enslin and his estranged wife (Mary McCormack) lost to cancer. This is ultimately a very frustrating movie because, despite the legitimate sense of terror it spends so much time nurturing, it just can’t quite keep itself together. For example, who sent Enslin the postcard? It most certainly wasn’t Gerald Olin. Did the room somehow send the postcard? We agreed that the first half was excellent and scary, while the second half was too scattered and strange for its own good. The acting, however, was never less than excellent, and Cusack did a particularly fine job portraying the unraveling protagonist. I liked the concept of Bruce Almighty, but I have little patience for Jim Carrey. That’s why I was pretty excited about Evan Almighty when it was announced, because it was going to focus on Steve Carell’s scene-stealing newscaster character. Morgan Freeman, one of my favorite actors of all time, would also be returning as God. 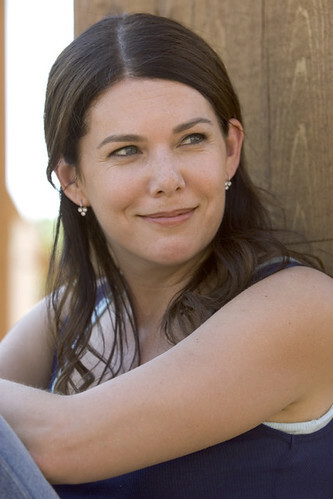 Evan’s wife would be played by the girl of my dreams, Lauren Helen Graham, best known to most of you as Lorelai Gilmore from the gone-but-never-forgotten Gilmore Girls. On one hand, Evan Almighty can be written off as relatively harmless fun. But upon deeper observation, it’s really about as flawed and as awful as any comedy I’ve seen in a long time. The actors cannot be faulted. Carell — who’s amazing as the severely underrated glue that holds NBC’s massively brilliant The Office together each week — delivers many more laughs and lovely moments than the script provides. And Graham is luminous with a strong screen presence, no matter how wildly inconsistent the screenplay is with her character. Freeman is warm and gentle with a hint of rascally, just like I’d wish the real God to be. Carell’s Evan Baxter upgrades from newscaster to congressman and moves his family to a new little suburb in Virginia, so that he’ll be closer to Capitol Hill. Their realtor, played by Molly Shannon, is named Eve Adams. Ha! That should be a good indication of this film’s level of hilarity. Anyway, parcels of wood and old-timey tools start showing up on his doorstep, and God shows up and tells Evan that he needs to build an ark to survive the coming flood. Evan’s hair starts to get long and scraggly, and he can’t shave off his giant new beard no matter how hard he tries, and animals follow him around, and everybody thinks he’s going crazy … even though he can’t shave off his giant new beard no matter how hard he tries, and animals follow him around. Crazy. Evan slowly accepts his task and builds the ark, and the flood does arrive via a plot twist that’s not really a plot twist because the villain behind it is hinted at so heavily throughout the movie. That’s when everything explodes into terrible special effects mode, and it all resolves into a sappy, wet mess of an ending. Rarely have I ever seen a movie that looks so cheap and poorly put together, despite a budget that swelled to at least $175 million. Part of the problem was the need to digitally paste in animals all over the place which, in itself, is also part of the problem! If the flood is only occurring in one tiny little valley in Virginia, why do lions and giraffes and every other kind of animal have to show up to get on the ark? The only answer is that someone apparently thought all those animals would be funny, even though they are rarely used for comic relief. Unless you consider birds pooping all over Evan’s congressional antagonist, played by John Goodman, to be funny. It makes no sense. It would have been funnier, cheaper and much more clever if, instead of including all those computered-in animals that don’t even belong, they’d have used the film’s huge supporting cast to play characters that represented different kinds of specifically funny people that end up on the ark. Instead we end up with people like Wanda Sykes playing the worst kinds of stereotypes, and it isn’t remotely funny. So we tried to find other ways to enjoy the movie. During one scene, Melissa became convinced that John Goodman’s eyeballs weren’t moving together. But other, darker dangers lurked within Evan Almighty. The worst script in the world couldn’t keep Steve Carell down, even though this one is trying pretty hard. 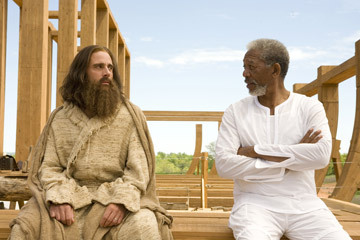 Evan Almighty looks cheap, feels cheap and should have tried a lot harder to capture true humor and heart. Oh, well. So it is. In other news, I do have a project I’d like to pitch to Lauren Graham. It’s called “love and babies,” and baby, I promise we’d have a world of fun. … which, thankfully, turned out to be the movie my whole day had been waiting for. With each role he takes on, Christian Bale asserts himself more and more as one of the finest actors we’ve got. He played Batman in my second favorite movie of all time, Batman Begins, and he’s wearing the cape again in its currently filming sequel, The Dark Knight, which debuts next July 18. 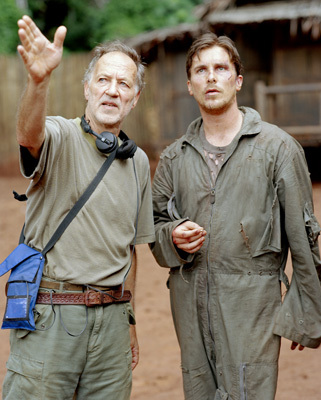 In Rescue Dawn, Bale and director Werner Herzog bring to life the true story of U.S. Navy pilot Dieter Dengler, whose small, one-man, prop-driven bomber was shot down over a hostile jungle during the Vietnam War. Dengler briefly eludes Pathet Lao troops before being captured and thrown into a secret prison camp that no one except for a man of Dengler’s inner strength and light could possibly escape from. 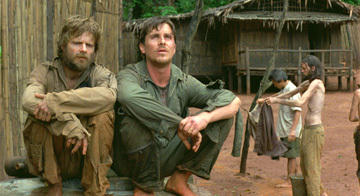 The other prisoners of war — including a couple of fellow Americans played by Steve Zahn and Jeremy Davies — have been there for years, but Dengler plans to scram immediately and begins working on a way to deliver himself and the other prisoners to freedom. As usual, Bale gives the role his total physical and emotional dedication. Every American accent he does is different, and in this one he sounds and acts totally unlike any of his other characters. (In fact, The Dark Knight will be the first time in Bale’s history in film that he’ll be using the same voice twice as he reprises the role of Bruce Wayne.) You’ll also be amazed at how deeply Zahn and Davies lose themselves in their characters. Their hearts have become as withered and as hollow as their bodies until Dengler shows up to challenge them — in wildly different ways for each man as the film progresses — back into action. Rescue Dawn is a phenomenally awesome piece of work that’s exciting, suspenseful and inspiring. For every time it breaks your heart in half, it turns around and brings you right back up again. (The scene where Dengler tells the story of why he wanted to become a pilot is one of the best moments I’ve seen in any movie ever.) It’s tough to watch at times, but when it’s over you’ll be glad you did. Check it out. Next up on the movie schedule are the comedy Superbad and the Jet Li/Jason Statham actioner War, which I have to review for the Brit mag. Massive Batman stunt in Chicago today! 2. I remember your “Day Tripper” cover taking place in July 1999–I was able to attend the performance only because I had just quit/been fired from my job managing the library collection agency in the weeks before grad school started. So as the only witness among this forum, let me valiantly say for the record: It wasn’t that bad. 3. When Ken — who as a teen was the top-ranked magician in Kentucky, whatever that means — stayed with me this month I discovered he hadn’t seen either of last year’s magician movies, so I told him we had to rent “The Prestige.” Ken loved it and watched all the special features, too. Oh, and I heard Zahn say that to look emaciated for “Rescue Dawn” he basically ran every day and ate next to nothing for two months. I’ve done that a couple of times myself but not for films. Yikes. 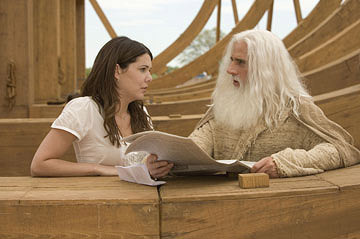 I liked Evan Almighty. Mostly because it was harmless fun. Not serious, a little out there and, something a lot of movies are missing these days, a movie you can take your kids too…you know? Anyway, I have four words for you: Death at a Funeral. Oh. My. God. Fan-freaking-tastic movie. On par for sure with Waking Ned Divine and The Full Monty, although not as sad as Full Monty.